On Thursday, Nazarbayev and Tokayev together spoke by telephone with Russian President Vladimir Putin, Putin's office said in a statement - an unusual move for the Kremlin leader who usually talks one-on-one with counterparts. Putin expressed confidence that Nazarbayev "will continue to actively take part in work aimed at strengthening the cooperation within the Eurasian Economic Union", a Moscow-led trade bloc of former Soviet republics. Astana itself is now being renamed Nur-Sultan on Tokayev's suggestion, despite some opposition from residents. Photographs published by the president's office showed Nazarbayev wearing a traditional Kazakh coat and fur hat and waving to onlookers, shaking hands with people and blessing newlyweds, with a smiling Tokayev by his side. Tokayev's first personnel decision was nominating Nazarbayev's eldest daughter Dariga for the Senate speaker position he had vacated, raising the likelihood that she would eventually take over as full-time president. 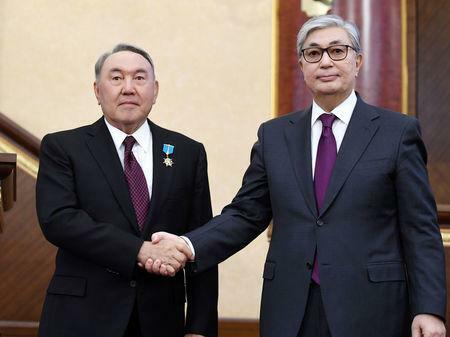 Tokayev is set to serve for the rest of Nazarbayev's term, which ends in April 2020. No candidates have yet announced plans to run in elections then, but there is little doubt that the one who secures Nazarbayev's backing would win.